So, first off you’ll want to have stuffy doll on the battlefield. Next you’ll want to play pariah enchanting stuffy doll. This makes it to where any damage done to you is dealt to the chosen opponent instead. 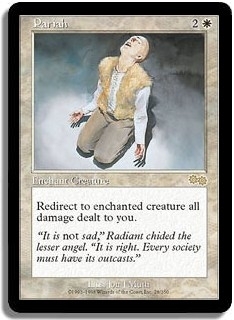 Pariah makes it to where any damage dealt to you is dealt to target creature instead and since stuffy doll already has natural indestructible, he doesn’t die. 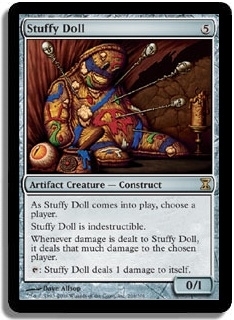 Also damage dealt to stuffy doll is dealt to chosen opponent also. Hope you enjoyed. Ps it’ll be more fun to flash in pariah with vedalken orrery.